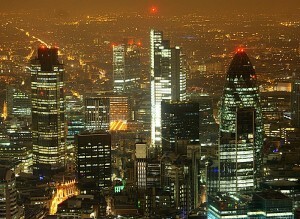 The Shard is now the tallest building in the EU at a height of 310 meters, setting the stakes high for new skyscrapers that are currently waiting to be approved. 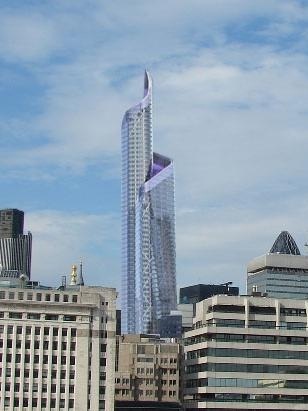 A number of glass skyline structures such as the Riverside South Tower, The Tower One and the Bishopgate Tower are now springing up in the capital and are set to be completed within the next few years. Once this is completed it will contain 88,000 square meters of office space, the twisting design of its roof and the curling patters in the façade are based on various organic forms in nature – such as armadillos, mushrooms and seashells. The glass used for the building is a double-layered skin, which will allow it to dynamically respond to climatic changes and utilise effective climate control with the lowest of energy consumption. The building will also contain more solar panelling than any other building in the UK, generating up to 200 kilowatts of electricity. 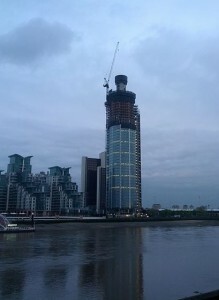 Another large structure set to be completed in 2014 is The Tower, One St. George Wharf, which will overlook the River Thames and the Houses of Parliament to become one of Europe’s tallest residential towers. The building has fascinating design features such as, a wind turbine that will power the tower’s common lighting and water heat pump technology that will be used to remove the warmth from the water in the winter to heat the apartments within it. London continues to be transformed into an incredible metropolis with such creative architecture, and these glass structures are just a glimpse of what the future of the capitals skyline will look like. With new, ambitious architectural designs emerging each day, Pilkington is committed to a wide range of high quality glazing solutions, as well as high performance glass coatings. To read more about the advantages of all our glazing solutions, please visit our official website and have a read through our different ranges.